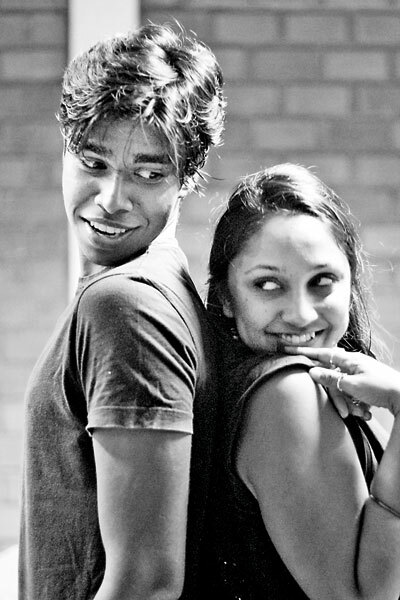 Fraught relationships: Michelle Herft and Shanaka Amerasinghe as Maggie and Cody; Mohamed Adamaly and Neidra Williams as Miguel and Sandy; and Duminda de Silva and Celina Cramer as Julius and Priscilla (below left). A Silent Hands production is always something to anticipate. This year they bring us Ric Robinson’s Asymmetry, a story of human relationships that holds up a mirror to the audiences, where they will see, parts of their own lives- unfathomed and unnamed till then. For others still, the play will shed light on completely novel experiences of living and loving. When Jehan Bastians and Neidra Williams, both directors, first saw the script, they were delighted by its realism and brilliance. It is the story of three couples, one of them much more mature than the other two. Their lives come to a head on the same night, though each couple, sharing the same space, is unaware of the other. The primary concern is with the symmetry or asymmetry of human relationships. Neidra herself plays Sandy, the female counterpart of the older duad who ‘takes whatever comes her way; lets everyone trample her and walk off”. Working through the script, Neidra felt she could relate to this character, though so different from her own ebullient self. She could understand that a woman to whom life had dealt so many blows could very well act the way Sandy does. The rest of the cast was also to find their characters contrasting with their own natures. Miguel, Sandy’s lover, is played by Mohamed Adamaly. Miguel is a poetry lecturer; flamboyant, artistic and naturally charming. Especially with the last point Adamaly fits the bill perfectly, but Miguel, in the course of the play, has to reveal a poisonous, dark side which would not have come easily to Adamaly. Adam speaks for the rest of the cast as well when he says the challenge lay in fleshing and bringing out complex characters within the very short appearances on stage. 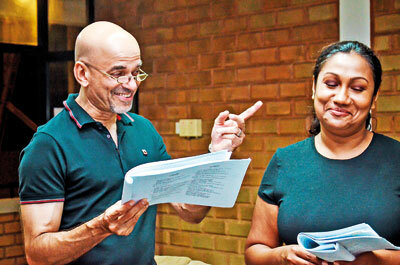 Michelle Herft and Shanaka Amerasinghe play Maggie and Cody. Both of them are troubled with the same serious (and socially taboo) affliction. Maggie, Michelle says, is ‘intricate’ and full of contrasts, her moods switching from one to another in a tumble. Michelle found it easy to become Maggie- her unconventional nature, being ‘risky’ and even how difficult she finds connecting with her lover. The asymmetry in the affair between the youngest couple, Priscilla and Julius, seems more imagined than real, but it’s just as debilitating: they frantically struggle to bring down the protective walls they have put up around themselves, and reach out to each other and be intimate. Celina Cramer, who plays Priscilla, found the character intriguing in that it portrays an erstwhile high school bully- a Lila Fowler-like figure- whose confidence had all of a sudden floundered. She now finds herself deeply insecure, with just short and feeble sparks of her former petty, vain nature. Devinda de Silva who plays Julius found being awkward so novel that he needed to vivisect the character of Ross Geller, of the sitcom Friends, and other iconic high school geeks. Working on the play, with people he had been idolizing from schooldays, made him feel “like a child in Disneyland,” he confesses, and he is deeply enamoured with the play itself. We have to leave it at that lest we spoil, for ourselves and others, a theatrical experience that promises to entertain as much as it enriches. Asymmetry, intended for mature audiences, will be staged at the Stables at Park Street Mews with 250 seats each night on May 11, 12 and 13 at 7.30 p.m. Tickets are priced at Rs.3000 each. Each ticketholder will be offered a plate of tapas and a glass of wine from Harpo’s at entrance. Tickets are now available at Park Street Mews.